Martha (Bahoosh) Redvanly, age 98, of North Bergen, NJ went to be with The Lord on her 98th birthday, November 20, 2018. Born in Paterson, NJ to the late Hanna “John” and Tooma Bahoosh, she resided in North Bergen for most of her life. She was a graduate of Memorial High School in West New York. 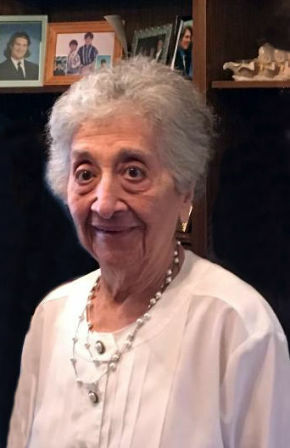 A faithful and active member of the Assyrian Orthodox Church of the Virgin Mary in Paramus, she was a member and past president of the Ladies Aid Society and the Mr. & Mrs. Club. Along with being a devoted homemaker, she was employed as a secretary with Spiral Binding Company of NYC, All Type Trucking of North Bergen, and most importantly the family business, “Pow-R-Pak Sales and Service, Inc” of North Bergen. Beloved wife for 45 years of the late Jacob Redvanly. Loving mother of Robert Redvanly his wife Susan and Diane Redvanly. Cherished grandmother of Andrew and Eric Redvanly. Dear sister of the late Mildred Bahoosh and James Bahoosh and surviving wife Lucy. She is also survived by many loving nieces and nephews. The family will receive relatives and friends Friday, November 23, 2018, 2-4 & 7-9 pm at Vander Plaat-Caggiano Funeral Home, 13-31 Saddle River Road, Fair Lawn, NJ. A funeral service is planned for Saturday, November 24, 2018, 10 am at Assyrian Orthodox Church of the Virgin Mary, 644 Paramus Road, Paramus, NJ 07652. Interment will follow at George Washington Memorial Park in Paramus. In lieu of flowers, donations in memory of Martha to the Assyrian Orthodox Church of the Virgin Mary would be appreciated. Dear Diane and Robert so sorry to hear about your mom. She was a wonderful kind person, with a big heart. I will never forget all the times I spent talking to hear on the porch. Diane and Robert, please accept my condolences. Your mom was a very special woman. She was among the many wonderful neighbors who were there to help our family when my dad passed. I will never forget that. I will always never forget her warm smile, sunny disposition and infectious laugh. It was always a pleasure to stop by your house and talk with her. It was never a superficial hello. It was like a game of 20 questions! Even after I left North Bergen, I kept in touch - out of love for my mom and respect for your mom. She kept me in touch with my roots and I was grateful for it. God bless her.